Please welcome today’s aspiring author Christine Wenzel, ready for a peer critique. Twelve year old Lupita Juarez remained sitting while the entire parish, twenty-two women, forty-eight children and nine men filed down the aisle towards the altar. She wanted to be alone when she said good-bye to her Mother and Protector. 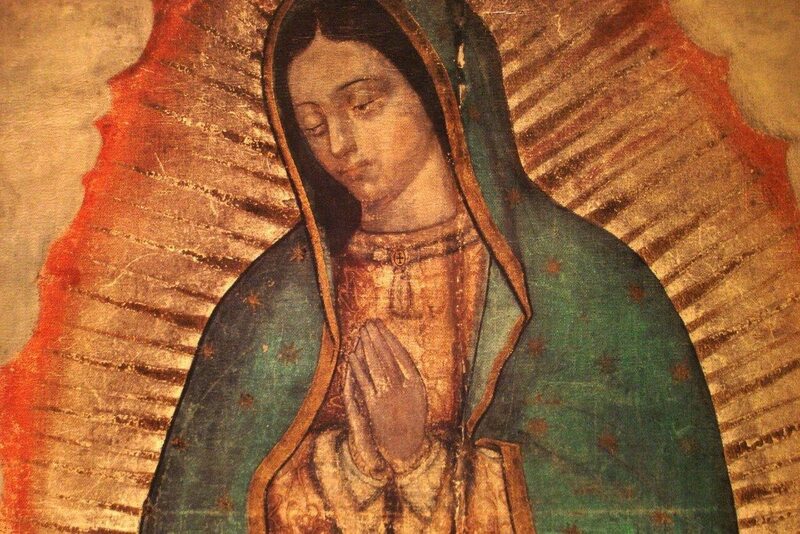 Her green eyes, teary bright and out of place in her oval brown face watched as everyone took their turn kneeling in front of the statue of Our Lady of Guadalupe. One by one, with the exception of the babies tucked sleeping inside their mother’s robozos, they bent and kissed the paint-chipped foot, then rose and in an exaggerated motion touched their right hand to forehead, chest, shoulders, a dutiful sign of the cross. Some stole a glance as they passed Lupita then returned their eyes to the floor, heads bowed, shoulders slumped until they cleared the rustic doorframe into the sunlight. Then like a light switch flicked on by an unseen hand the sombre mood lifted and Father Ignacio’s parting blessing to go in peace was left on the church doorstep. The children rewarded their one hour of silence and good behavior by chasing each other, pushing and grabbing until one of them would fall on the dirt path, mindless of soiling their only white shirt or dress needed for school the next day. The women congregated in tight groups, eager to share their knowledge and sentiments of the latest blight afflicting the Juarez family. They shook their heads, tutted, and agreed it was sad, then united in the conviction it was best Lupita leave their mountain village. My snap thoughts are that this is a deeply thoughtful opener. It packs in a lot of detail and its pace is slow. It might work well later in the story, once the reader has been teased into the plot thread. However, for an opener it’s too dense, like a rich slab of fruit cake. Could it be broken up by a few terse exchanges of dialogue and/or micro-conflict? Perhaps some of the parishioners mutter a greeting to Lupita but she ignores them. And they look at her strangely. This would intrigue the reader. Why does she want to be alone and silent? The passage might also open with the Indispensable Incident, the line: ‘It’s best you go’. Then the context of the church could be given by way of a brief flashback. Now we’re into the story! Hi John, Your comments help a lot. I have fluctuated many times between starting with the scene that forces the decision to have Lupita leave the village and this one where she is saying good-bye to the statue, her honorary mother since hers died while birthing her. I was quite confused with this opening but aside from a few awkward bits that gave me pause I quite like the writing (those being: “Mother and Protector” sounds like two people but is really just one? ; “green eyes, teary bright and out of place”, which part makes them out of the place, being green or teary? ; “One by one, with the exception…, they bent” didn’t flow well; I want “in an exaggerated motion” offset in commas and ditto for “like a light switch flicked on by an unseen hand”; did the children reward themselves or were they rewarded?). By the end I’m guessed that “Mother and Protector” is the Lady of Guadalupe (?). I would read on to answer two questions: why she is sitting out and what happened to her family. Thank you and ditto to my response to John’s comments, I appreciate the help that the church is not the place to start. My immediate reaction was that this has the making of a good story with many questions raised in the first paragraphs. have been used less and the showing style used more. The church interior could be shown to give the piece more atmosphere and the statue shown in much more detail. Lupita was obviously sad from the fact that she was crying but why not show how sad she was by her posture etc. I believe that a little dialogue even if only of Lupita’s thoughts as she sat in the pew. The women congregating at the end of the service be given more description and could use dialogue to show their feelings. If one is using the third person, which is perfectly OK, then dialogue can bring the story to life more quickly. On the basis of this very short extract I think it inappropriate to be critical of this work. I liked the basic story and the clear introduction of the basic plot. Remember this is only my opinion and given in the hope of helping not hindering. Thank you Phillip. You give some great solid showing not telling suggestions. I especially like how describing her posture would help, and yes adding dialogue should add some strength. I’m not sure about the handling of internal dialogue though. I’ll have to sleep on that. Isn’t writing amazing, we’re always cutting and adding. I love the act of fine tuning. My first reaction to this piece is that your writing is very well done. Your description paints wonderful pictures. I can see the children running and playing. I can see the women, feel the tension, even smell the dusty air, though that isn’t mentioned. You create a clear sense of place here. I also like that we know only that Lupita has the typical brown face of the others around her but not the brown eyes. Great understated but interesting and important detail. I got that her green eyes were out of place immediately. I also like that you chose your details without overwhelming the story. well done. I am left with lots of questions which make me want to read on, something I think good openings should do. Who is Lupita? Why is she different? What has happened? Why is her family blighted? Perhaps you could add some tension here or in the next paragraph or so to increase the urgency of the reader wanting to find out what is happening here. Is there a villain that could also be in the congregation or just outside of view that she alone can see? I enjoyed this piece and encourage you to continue. It promises to be a thoughtful and well written story. I enjoyed it! Hi Shannon, nice to meet you here and over on twitter 🙂 I enjoyed visiting your blog, as well as the other writer’s websites, who have been so kind to take time to weigh in on my short excerpt. It’s interesting and I’m happy that you picked up on the green eyes and that they play a part in the story. She is the only person in the indigenous village with green eyes, along with some other differences that has not made life easy for her to be included. I enjoyed your opening excerpt. It paints the atmosphere in the church, shows the motion and ritual in this space, the setting, the context, all the things needed to ground the reader, but I tend to agree with John, in that you could almost ‘jolt’ the reader, thrust them further into the story and raise an immediate story question. By end, my curiousity would have kept me reading on to some extent: what was this ‘hinted at’ curse on Lupita’s family, and what harm would she escape by moving her from her village — but I didn’t have a sense that it could be something dreadful, something that would upturn her world entirely and catapult us into a story. I think the writing draws us in certainly, but focus on the voice of Lupita if you can — what does she hear, think, feel with all this surrounding her? This may not be the POV for your novel, but the reader would empathise being a little closer to her again I feel in the opening scene. I think these are only really minor tweaks: starting your story a few sentences ahead, or showing some internal reflection. You have the basis for a strong story I think that will ground us quite firmly in another era or another culture. Hi Tamara, like John’s suggestion your thoughts to start earlier has helped me a with a decision I’ve fluctuated with a lot. Also it should help with what you say about creating the sense of dread to bring the reader in earlier to why this shatters her world and future. You’ve received a lot of feedback already that echoes some of my own initial reactions, so I won’t repeat it. I’ll add that, being Mexican, this struck me as being written from the point of view of a non-Mexican–and I’m assuming your characters are Mexican from the Guadalupe reference. The observations regarding the fact that green eyes are “out of place” in a brown face seems rather stereotyped, for example (plenty of green eyes in Mexico), and qualifying the sign of the cross as “exaggerated” seems like something only an outsider would observe. I’ll pass on the advice my editor gave me in respect of issues like these (since I also write about Mexico with preoccupying frequency): in order to make the story surge organically, it’s important to avoid drawing these “outsider” references. It’s very tempting to try and explain everything for foreign readers, but in doing so we distance the reader from the story. My protagonist is Zapotec from a remote village in Oaxaca, a place where green eyes stand out. I very much like the useful advice your editor gave you and appreciate you sharing it. You do a great job at setting the scene. I can picture exactly what is going on. I agree with many of the other comments. This seems very dense for an opening and may start too much in the middle of the action. I’ve learned that it’s good to begin with a normal day for your MC. That gives the reader a sense of the MC’s life and also a chance to care about the MC. In addition, in the middle may necessitate a flashback to explain what happened before. What brings the MC to this scene at the church? Is it a burial? Her last day in town? At first I mistook the part about “Mother and Protector” to mean that she lost her mother. I agree about not including excessive explanations of the religious aspects of the scene. I’m not religious at all and I know what the stations of the cross are. There are places were you can condense the writing and not lose the meaning. “The children rewarded . . . the next day,” is a long sentence. The children, released from their hour of stillness, chased each other over the packed dirt. They ignored their mothers’ pleas to spare their only dress clothes. Hope this is helpful. Good luck with revisions. Hi Liz, you give some great suggestions for ways to tighten my writing. I really appreciate your thoughtful comments – very helpful. I want to give some thought about starting with a normal day and then how it goes downhill from there. Many thanks for taking the time to read and comment! I’m in! It felt like ‘Blood Ties’ by Pamela Freeman or an adult version of Jackie French’s ‘Oracle’, although I’m not sure if that was what you’re aiming for… I’d have to read more to get a full picture of time and place. I really enjoyed and want to know more, which I think is a really good place for a book to start. The squinty-eyed view of the paragraphs looks a bit scary though. Perhaps they need to be broken up a bit here and there so they’re not so big and full. Love it!! Hi Jackie, Thank you for taking the time to comment and making some tangible good useful points. I got a kick out of your description of “squinty-eyed view” being a reading glass wearer myself 🙂 I’ll check out the authors you mentioned, I enjoy discovering writers I don’t know of. The opening is not correct. It has wordiness. There are so many ambiguous characters. Sentences are long. It seems like a woman who talks very much even trivial. It will be the reason that no one will hear you. I think there should be more clarity of the concept. It seems deep. Forgive me for harsh critique. I am only giving my opinion. Last decision should be from you. If it wil increase the beauty of your craft or raise your presitige then follow it, otherwise fling it into bin! “It seems like a woman who talks very much even trivial. It will be the reason that no one will hear you.” Ouch!